In preparation for our nation's celebration of independence, I offer two home-grown terroirists guaranteed to disrupt your palate and have you surrendering to the greatness of the US of A. Here's wishing you all a safe and enjoyable Fourth of July. Cheers! Good Chardonnay from a great year. 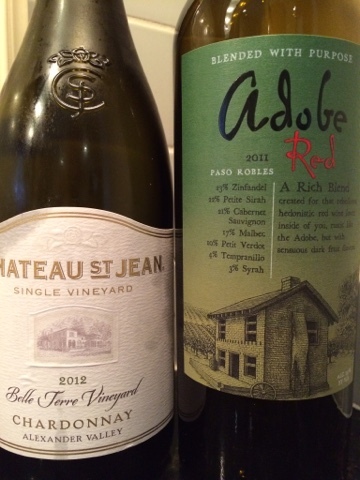 At once both more restrained and still as extroverted as the archetypal California Chardonnay. Not only does this one have the reins on its ripeness, but manages to deliver a framework of acidity uncommon except in the stratosphere of pricing for this genre. With one foot in each camp, this delivers on many pleasure points. There are two things that I generally disdain in red wines: overblown and patronizing fruit, and deliberately green vegetal characteristics. This one possesses both, but somehow manages to come off as extremely appealing. Perhaps for it's unexpected balance and "throw it all in the tank" devil may care blending approach, it comes across as authentic and irresistible.